How to I approach a creative agency for the first time? Will they be able to manage my budget and provide creative services? What if the project outcome is not what I expected? Looking to find the right design agency to help bring your creative ideas to life? We have created a step by step guide to help you prepare your own design brief that will help you hire the right designer for your brand. Bringing any new asset, from systems to people, into your business can be nerve wracking, particularly when you specialize in a niche market outside of the design world. When looking to hire a creative agency to best represent your brand, every designer will need a clear understanding of who you are, what you would like to achieve, and your expected end goals so that they can develop a visual identity that is true to you. Developing a great design brief will help you organise your ideas and help you find the right creative agency to bring these projects to life. Over the past 10 years, we developed key questions that we ask when starting out with each new client. Answering these questions prior to approaching an agency can help you develop the foundation of your design brief by simplifying what your objective is, who is your target market, and what the project outcomes need to be. Although design agencies specialise in creating visual entities of your ideas, no agency can understand the intricacies of your business, projects, and clientele like you. We rely upon the information your team can provide us to find the most accurate representations of your brand’s voice – which further emphasizes the need to prep your ideas and project expectations before hiring professional services. Designers would like to know more about you! Send them some insight into who you are, what your business is, and who they could be working with. Your next point of call is to describe in detail what services you would like completed and what deliverables are to be produced by the creative agency. Tell us what you are hoping to get out of the project – more brand awareness? Perhaps you are establishing a new company? Are you trying to increase sales? List the specific goals you would like to meet. This is where you will provide an outline of what you’re trying to achieve and why you want to achieve it. Tell us what you are hoping to get out of the project – more brand awareness? Perhaps you are establishing a new company? Are you trying to increase sales? List the specific goals you would like to meet. Who is the design geared toward? The more detailed, the better. For example: “Females in Australia” is too vague. A good way to determine who your niche market is is by creating a ‘customer persona’. What do you need the designers to do for you? Do you need a brand strategy or positioning strategy? Do you need a designer to create website graphics or do you need an entire webpage developed? If you’re not yet certain what you need, write down what you think you’ll need. Your design team can help you sort through which services will be necessary to achieve your project outcomes and guidance on why some services are not recommended. A deliverable is a physical outcome of our time together. They are a tangible asset that your business can use going forward such as a business card design formatted for future printing. Please list what tangible products you would like to receive at the end of your design project. What are you expecting to achieve? Picture your brand as a person – are they fun, colourful and loud? Or is he/she quiet and minimalistic? This imaginative process helps designers define the overall aesthetic of your design. Nominate 3 brands that are similar to yours for us to review. Give us a brief explanation of their product/services, industry position, and how you are different to them. Nominate additional brands whose visual identity you like (and those you don’t!). These examples don’t necessarily need to be in your industry but it will give designers a good idea of what aesthetics appeal to you. Help your designers with project research. Where do you find information about your industry? What publication or blogs do you read and what sort of research do your clients do when it comes to making a purchase decision? Do you read online reviews? Do you follow trusted Instagram influencers? Give us a snapshot of your product or service industry and where we can gain further insight. How will your design materials be used? Are you planning launch events? Will you need accompanying social media? Web copy developed using Google Adwords? Printed handouts? Or help to organise a media kit? What are your plans for promoting your business in the future? Will you be publishing a weekly newsletter? Blogging? Organising promotional events? If you don’t have the answers to these questions just yet, feel free to ask your potential agency for suggestions that will support your brand strategy. When does your project need to be completed by and what is your budget? Knowing when you need your deliverables and how much you are willing (and able) to spend will save you headaches (and frustrations!) in the future. Do you have a very specific deadline by which your project needs to be completed? Or perhaps you have a little more flexibility, but would like to launch your social media campaign in line with a new product reveal? Outlining key project dates in your brief will help the designer determine if the outcomes are achievable and come up with a mutually suitable deadline if not. One of the most important considerations when working with an agency is to give your designer a project budget. Knowing budget limitations can help a designer tailor what services will best suit the project and offer specific design solutions to ensure the client will achieve their expected goals with fewer, and more cost effective, recommendations. If you’re considering approaching a design agency for the first time, you may be uncertain as to the cost of creative services. The right agency will be able to provide you service costs and project quotes, however, knowing how much your company can comfortably spend on design before approaching any agency will ensure your business stays on track financially while pursuing creative brand solutions. 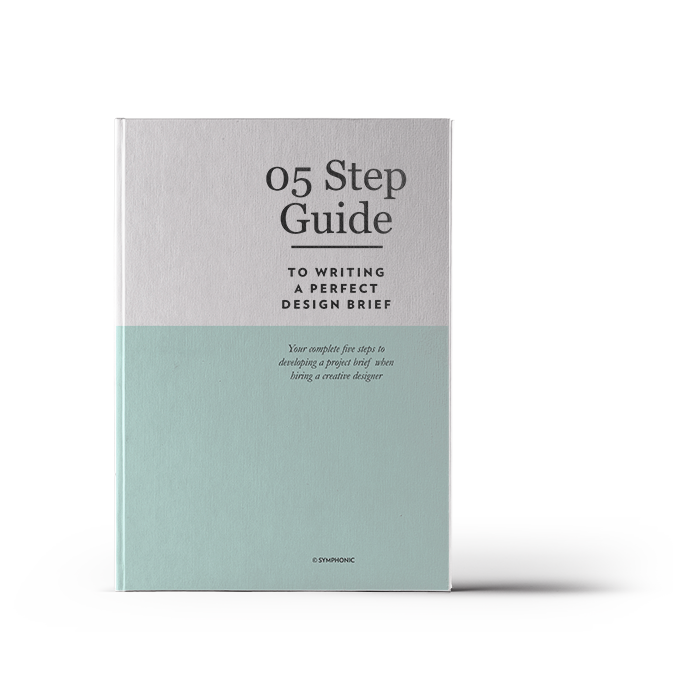 If you enjoyed this article feel free to download our full ebook guide start creating a perfect design brief.